So much is known about Buckskin Girl, but at the same time so little. She was discovered April 28, 1981 in Troy, Miami Co., OH. She had been strangled. 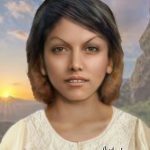 Because her body was found with a day or so of her death, DNA, fingerprints, and dental information were available, but after 226 rule out (as of Feb 2018), she has remained unidentified. Buckskin Girl is so-named because when she was found, she was wearing a homemade deerskin poncho, over jeans and a turtleneck sweather. She was barefoot. Buckskin was between 18-27 years old, 5’4″- 5’6″ tall, and weighed 125-130 lbs. In 2016, Buckskin was entered into the database of the National Center for Missing and Exploited Children (NCMEC). An artist’s rendition of her face was created. Pollen tests on the deerskin poncho indicated she had spent time in northern Mexico or the southwest United States. This was consistent with isotope tests on her hair; 18O concentrations indicated she had spent time in northern Texas for two months at least twice during the year prior to her death.